What a wonderful stash, Lisa. It's nice to have so many pretty things to use, but I can relate to the need to use them and move them out at some point. You've reminded me of a few identical items in my own stash that I need to dig out and use. Having too many items can actually be paralyzing! Good luck with your summer projects. Love this idea for a challenge! I'll have to go through my stash and decide what I want to use! I'm definitely going to use at least one stamp set and some dies as well. Oh and a stencil too! I just saw a great video from Shimelle where she used a cute stamp set on about 5 different projects. Good luck and happy scrapping!! 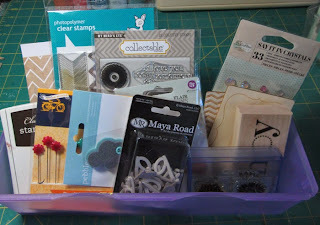 Wow, you have picked a lot of supplies to use up this summer. I am trying to use up my scrapbooking kits I purchase last year and the year before.